[225 Pages Report] The medical supplies market is expected to reach USD 136.63 billion by 2021 from USD 98.33 billion in 2016, at a CAGR of 6.8% from 2016 to 2021. The dialysis consumables segment is projected to register the highest CAGR during the forecast period. The major factors contributing to the growth of this market include increasing patient pool for renal diseases, rising incidence of diabetes and hypertension, growing geriatric population, and increasing adoption of dialysis procedures over kidney transplantations. The base year considered for the study is 2017, and the forecast has been provided for the period between 2018 and 2023. According to Baxter International, Inc. (U.S.), 3.6 million dialysis and transplanted patients were reported in 2015; this is expected to reach over 4.6 million by 2020. In addition, in the U.S. alone, the number of ESRD cases is expected to reach 785,000 by 2020, due to the addition of ~151,000 patients per year, an increase of 60% as compared to 2005 [Source: The United States Renal Data System]. In addition, the increasing incidences of diabetes and hypertension; rising geriatric population; and increasing adoption of dialysis procedures over kidney transplantations are also supporting the growth of this market. The major players in the market are Boston Scientific Corporation (U.S.), Johnson & Johnson (U.S.), Medtronic plc (Ireland), Becton, Dickinson and Company (U.S.), Cardinal Health, Inc. (U.S.), B. Braun Melsungen AG (Germany), Baxter International Inc. (U.S.), Thermo Fisher Scientific Inc. (U.S.), Halyard Health, Inc. (U.S.), and 3M Company (U.S.). In November 2016, St. Jude Medical, Inc. (U.S.) launched its EnSite Precision Cardiac Mapping System and the Sensor Enabled Mapping Catheter in Europe. In April 2016, Acelity L.P., Inc. (U.S.) added seven new products to its existing TIELLE foam dressing product line in the U.S. In March 2015, Bayer Healthcare (Germany) received Japanese approval for its MRI contrast agent, Gadovist. The medical supplies market is projected to reach USD 136.63 billion by 2021 from USD 98.33 billion in 2016, at a CAGR of 6.8% during the forecast period. Medical supplies include single-use or disposable products used in all healthcare facilities such as hospitals, clinics, and nursing homes. They are categorized based on their applications and usage in healthcare facilities. Some medical supplies such as hypodermic products and inhalation supplies are used in drug delivery procedures, whereas, sterilization and infection control supplies are used to prevent infections in healthcare settings. For diagnostic procedures, medical supplies such as glucose testing strips, diagnostic catheters, and blood collection consumables are frequently used. Moreover, for the safety of workers in hospitals, personal protective equipment (PPE) are used which help prevent injuries and minimize radiation exposure. Growth in the medical supplies market is primarily driven by the increasing prevalence of chronic and infectious diseases, rising number of surgeries, growing geriatric population, and rising number of hospital-acquired infections (HAIs). However, strict and mandate regulatory requirements for the approval of medical supplies and rising number of product recalls are expected to hinder the growth of this market. In this report, the medical supplies market is segmented on the basis of type, application, end user, and region. Based on type, the market is segmented into diagnostic supplies, dialysis consumables, wound care consumables, inhalation products, radiology consumables, infection control supplies, infusion products, intubation and ventilation supplies, personal protective equipment (PPE), hypodermic products, sterilization consumables, and other supplies. The dialysis consumables segment is projected to register the highest CAGR during the forecast period. The major factors contributing to the growth of this market include increasing patient pool for renal diseases, rising incidence of diabetes and hypertension, growing geriatric population, and increasing adoption of dialysis procedures over kidney transplantations. 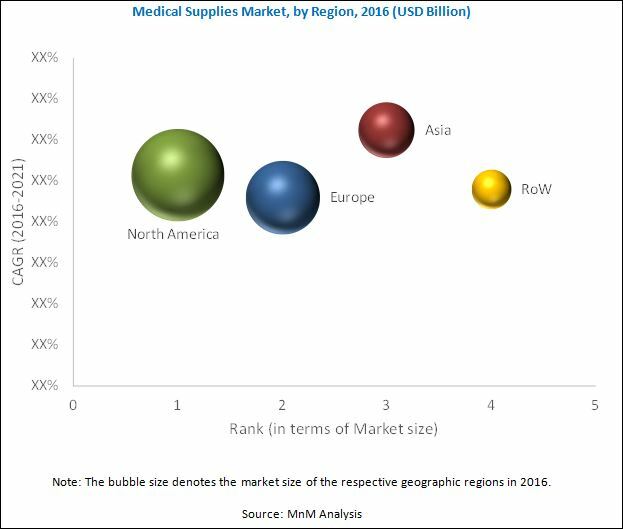 In 2016, the medical supplies market was dominated by North America, followed by Europe, Asia, and the RoW. However, Asia is projected to be the fastest-growing region in the forecast period, owing to factors such as the rising geriatric population, increasing incidence of various diseases, growing medical tourism industry, and improving healthcare infrastructure. Urology is an important application segment in the medical supplies industry and has witnessed significant growth in recent years owing to the increasing incidence of kidney and urological conditions, and the rising geriatric population. The prevalence of urological and kidney diseases, such as chronic kidney disease (CKD), end-stage renal disease (ESRD), urinary tract infection (UTI), urinary stones, benign prostate hyperplasia (BPH), kidney cancer, and bladder cancer, is increasing across the globe. According to the Scottish Kidney Federation, over 500 million people across the globe suffer from some form of kidney disease. 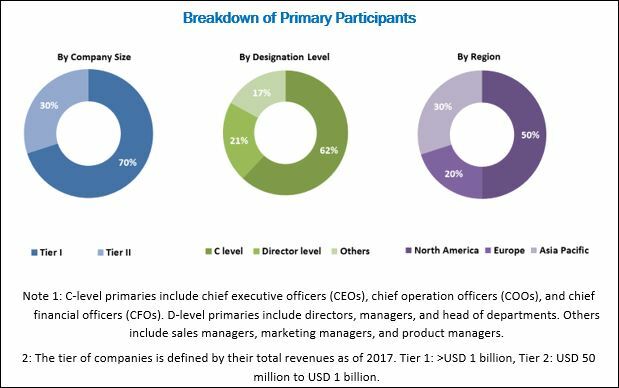 A number of factors, such as the increasing incidence of diabetes, rising geriatric population, and growing awareness about wound care, have triggered the growth of the wound care market across the globe. According to the International Diabetes Federation, in 2011, globally, 366 million people were affected by diabetes, and this figure is expected to reach 552 million by 2030. According to the CDC, up to one in three American adults will have diabetes by 2050. This is an important indicator for the growth in demand for wound care products in the coming years because ~15% of the total diabetic population suffers from diabetic foot ulcers (Source: Cellular and Molecular Basis of Wound Healing in Diabetes by Brem H., Journal of Clinical Investigation). Thus, the increasing incidence of diabetes will correspondingly drive the demand for wound care consumables. Various types of medical consumables are used by healthcare professionals during anesthesia procedures. Majority of the consumables used in these procedures are disposable in nature to reduce the risk of infections. Some of the major consumables used in anesthesia include endotracheal tubes (ET), tracheostomy tubes, laryngeal tubes, I.V. cannula, needles, catheters, and breathing circuits. The major factors driving the growth of the medical supplies market for anesthesia applications include the increasing number of surgical procedures being performed across the globe and increasing incidence of respiratory diseases. A contamination-free environment is important for all medical procedures in healthcare facilities. This is because a contamination-free environment prevents various types of HAIs in hospitals, clinics, and nursing homes. Sterilization consumables and supplies, such as detergents, sterilization indicators, pouches, and lubricants, play a pivotal role in providing contamination-free environments in hospitals. What are the upcoming industry applications for medical supplies? Stringent Regulatory Requirements for the Approval of Medical Supplies is a major factor restraining the growth of the market. Regulatory authorities across the globe have laid down stringent regulations the approval and commercialization of medical supplies and consumables around the world. Regulatory bodies such as the U.S. Food and Drug Administration (FDA); the European Medical Device Directives (CE); and China Association for Medical Devices Industry (CAMDI) are responsible for the approval of medical supplies and consumables in the U.S., Europe, and China, respectively. The major players in the medical supplies market include Becton, Dickinson and Company (U.S.), Boston Scientific Corporation (U.S.), Johnson & Johnson (U.S.), 3M Company (U.S.), Medtronic plc (Ireland), B. Braun Melsungen AG (Germany), Thermo Fisher Scientific Inc. (U.S.), Cardinal Health, Inc. (U.S.), Baxter International Inc. (U.S.), and Halyard Health, Inc. (U.S.). 11.8 Thermo Fisher Scientific Inc.